This spot is not simply a place to rest your Louis Vitton luggage, it is a Hollywood institution. If only its pastel pink walls could talk, they would whisper scandals and secrets that any tabloid-loving ears would be overjoyed to be privy to. Faye Dunaway learned how to swim in the expansive pool, Elizabeth Taylor honeymooned here after one of her many, many nuptials and Yoko and John staged a casual ‘bed-in’ in one of their Bungalows. 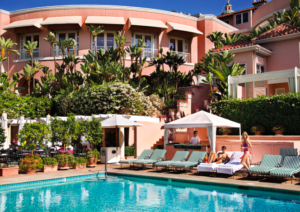 For five-star service and a peek behind an almost century-old velvet rope, jetset over to The Beverly. 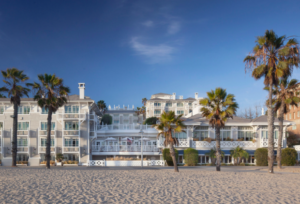 With its sweeping views of the sprawling city, palatial suites and quintessential LA charm, Casa del Mar deserves its title as one of the world’s most luxurious hotels. It was first known as a celebrity beach bar in the twenties but has since transformed into a more demure version of its younger and rowdier self. 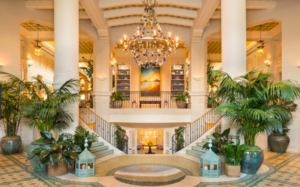 The interior is a delicate mix of Italian design, ornate Spanish touches and coastal Californian flare. Check in, order a poolside Pina Colada and be wistfully transported to another time. For a stay with a spectacularly modern twist, the Nouveau Riche flock to the SLS. 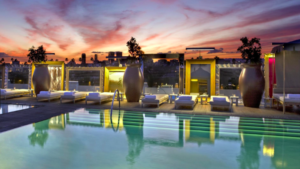 This is standard Hollywood luxury service with a plumping injection of boutique hotel fun and flirtation. The rooms are the picture of unfussed elegance, the food is molecular-chic while the clientele is unquestionably A-list. If that wasn’t enough to tickle your indulgent fancy, there’s a rooftop pool, exlusive gym and Philippe Starck-designed spa. For those LA visitors who want to shroud their dollars in a touch of unpretentious ease, Shutters is ideal. A stay at the hotel is akin to spending a weekend at your very rich Uncle’s beach house. The walls wear their Lichenstein prints and original David Hockneys with humility, while the hotel’s interior of off-whites, sky blues and clapboard wooden touches makes for a quieter sense of luxury. For spectacular sunset views and the occasional celebrity spotting, head to Shutters. 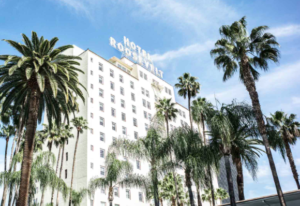 There is nothing that sings with the golden charm of Old Hollywood quite like The Roosevelt hotel. Opening its doors in 1927, the spot was the location for the very first Academy Awards. Starlets and celebs are drawn like Chanel-wearing moths to this superbly located flame. There is a cocktail lounge, a 24-hour gourmet burger joint, a poolside cafe and a vintage bowling alley. Dine, drink and sleep like the stars do – only at The Roosevelt.